This recipe delivers a warm and filling salad that is perfect for chilly days. To save on clean-up, line the baking sheet with parchment paper. A squeeze of lemon or lime right before eating gives this salad an extra pop. Top this salad with hard-boiled egg, chicken breast, bacon, or white beans for added protein and to make it a complete meal. This would also make a satisfying filling for tacos or a burrito, especially if you add crumbled queso fresco, goat cheese, or feta cheese. Per Serving: 478 calories; 29g fat; 50.9g carbohydrates; 12g protein; 0mg cholesterol; 424mg sodium. Great Paleo saute that I pair with my baked pork chops. It's a nice rustic side that will honestly please a vegetarian just with a fried or poached egg on top. I love sweet potatoes, I've been eating more of it lately. This salad is definitely one of my favorite recipes. 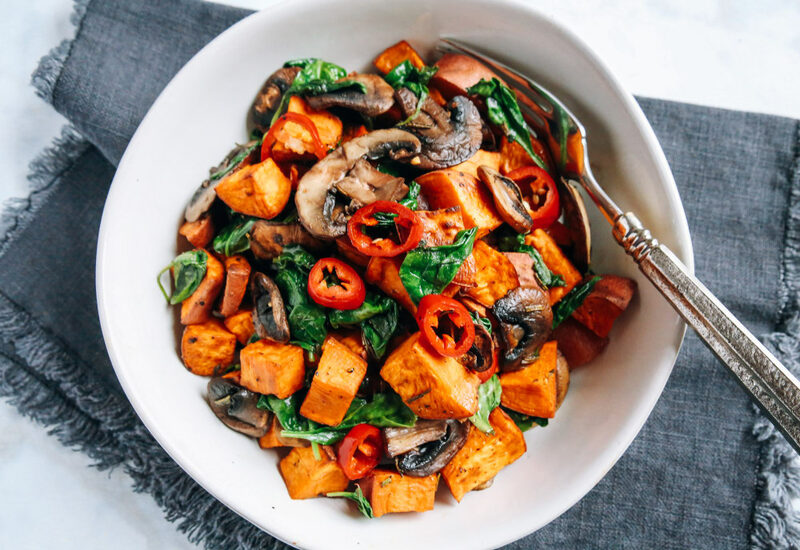 It's simple, yet has delicious flavors with the garlic and chile pepper cooked in with the mushrooms, tomato, and spinach. It's the perfect "warm" salad.